*This experience was made possible in part through a partnership with Visit Santa Barbara and Eat This! Shoot That!, and all opinions expressed here are our own. Our family loves to eat good food. It’s just a truism about us. So on a recent visit to Santa Barbara, our family wanted to try something different. Since we really love both eating and taking pictures, when someone recommended Eat This! Shoot That! as a great food tour in Santa Barbara, we just had to check it out. And you guys, it was the coolest thing. An interesting combination of walking culinary tour and a photography lesson, Eat This! Shoot That! leads participants through Santa Barbara’s Funk Zone to discover treats for both the taste buds and eyes. 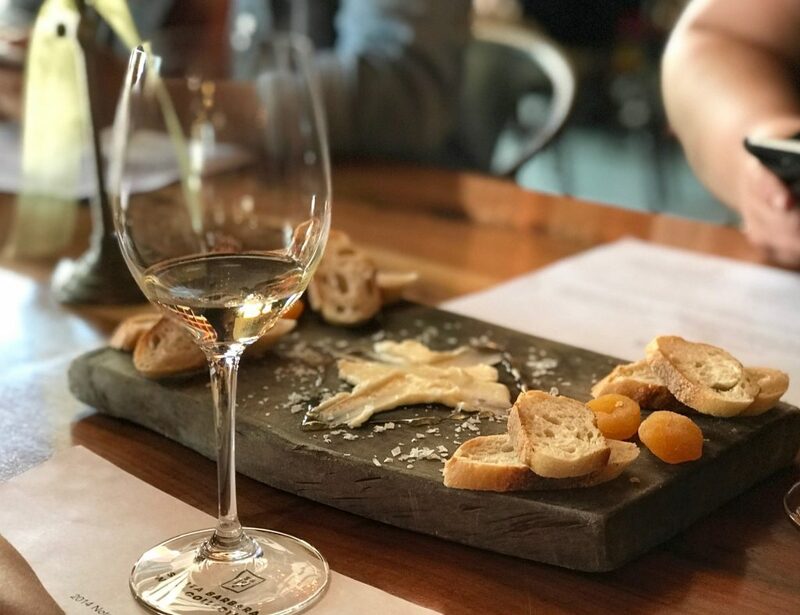 We love Santa Barbara like a second home, and yet there is still so much to explore there including their newly famous Urban Wine Trail. What a perfect way to show us the latest and greatest! Reservations made and comfortable walking shoes slipped on, we made our way to the designated meeting place for this great food tour in Santa Barbara. We found our guide Andrew waiting with another couple in front of the Enterprise Fish Company on Lower State Street, and we were off and running. Well, off and walking anyway. 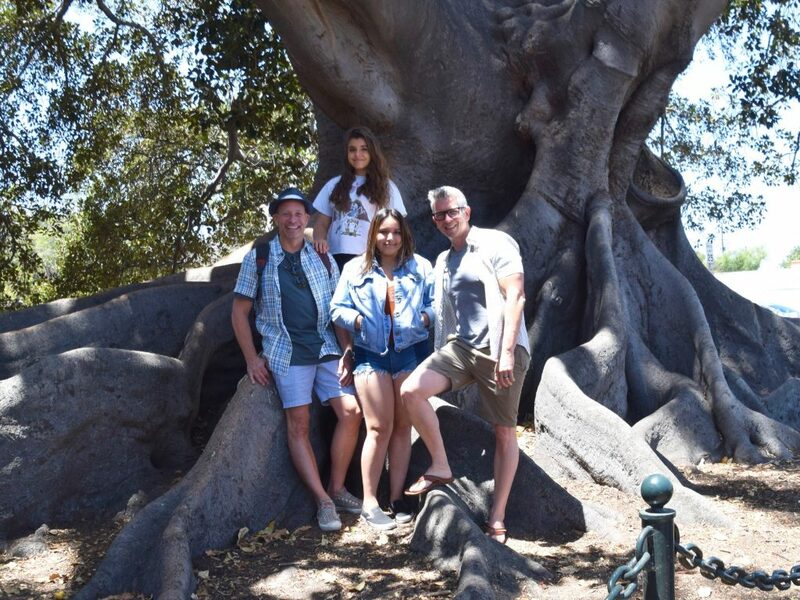 The Moreton Bay Fig Tree is a landmark in Santa Barbara, and is estimated to be the largest and oldest in the US. When I lived in Santa Barbara years ago as a student at UCSB, the area of warehouses and nasty abandoned buildings east of Lower State Street was no man’s land. If it’s possible for a city as gorgeous as Santa Barbara to have a trashy neighborhood, this was it. It even earned its name, The Funk Zone Santa Barbara, because for decades this was the area of town where fisherman, marine repair shops and other industrial trades made their living. It was just plain stinky. But with the ingenuity of artists and creatives, the area slowly evolved. Interesting older buildings and warehouses became occupied by artists, sculptors and the creative community that seeks a more funky scene. And The Funk Zone was born. Now a bustling and ultra-popular area of Santa Barbara fully feeling its own rebirth, The Funk Zone played host to our Eat This! Shoot That! tour route. We could not have found a better way to dig into this lovely city. 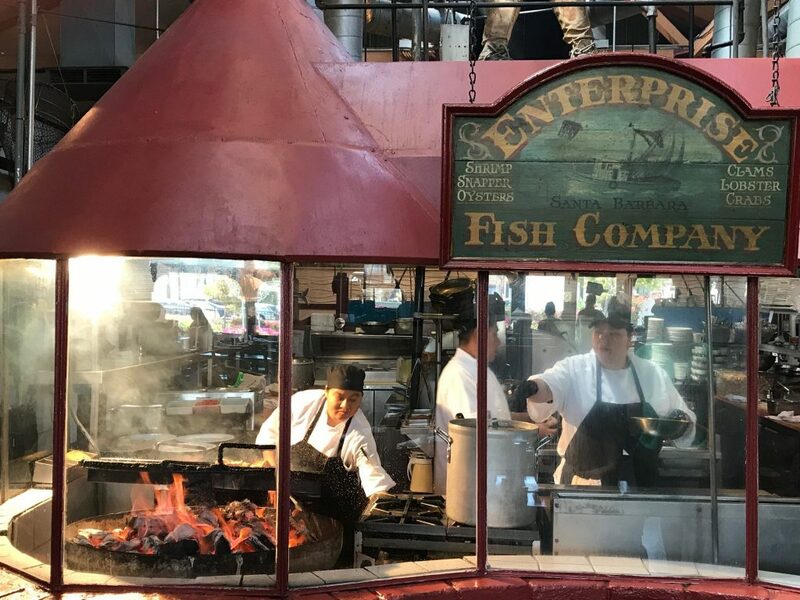 The wood-fired grills are tended daily in the open kitchen at Enterprise Fish Co.
Just as cool now, Enterprise was host to our first stop on the Eat This! Shoot That! tour. 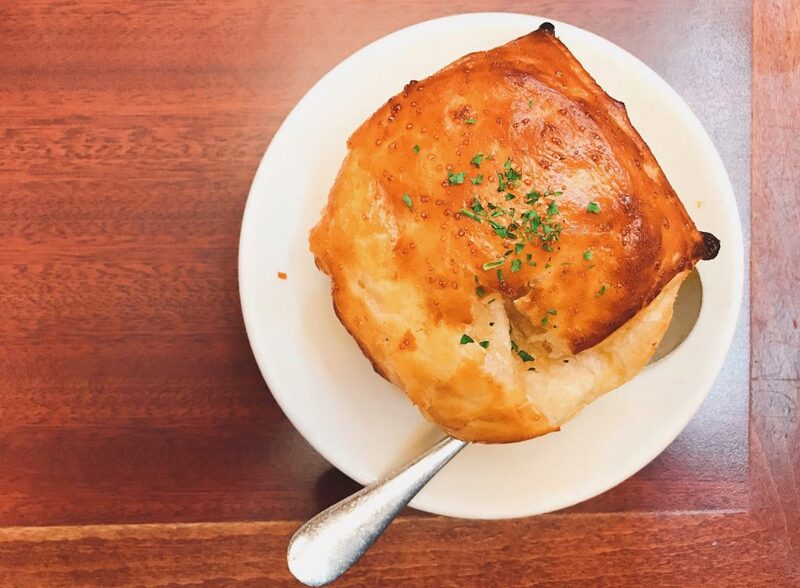 They served up Lobster Bisque with a buttery-licious puff pastry crust that was to die for. While we slurped our soup, Andrew taught us a few pointers on food photography using an iPhone. Eureka! 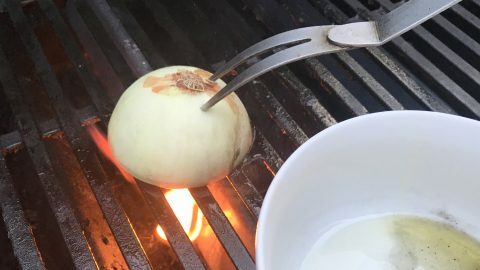 Some of these tips were so easy, but these techniques had never been explained to us before. Our photos became instantly better. Our tour started out with a creamy lobster bisque at Enterprise Fish Co. Photography Tip: Always have the grid showing on your iPhone screen. It allows you to better block the shot, laying out where you want the main subjects to appear in relation to the frame. I tried that in the shot at Enterprise – see that the shot is more interesting if I offset the dish so it’s not in the exact middle of the frame. In the back of popular restaurant Loquita is Poquita, a tiny but fun places for pinxtos hand-fired and served fresh. Just around the corner from the main entrance of popular Spanish tapas restaurant Loquita is its little sister Poquita. 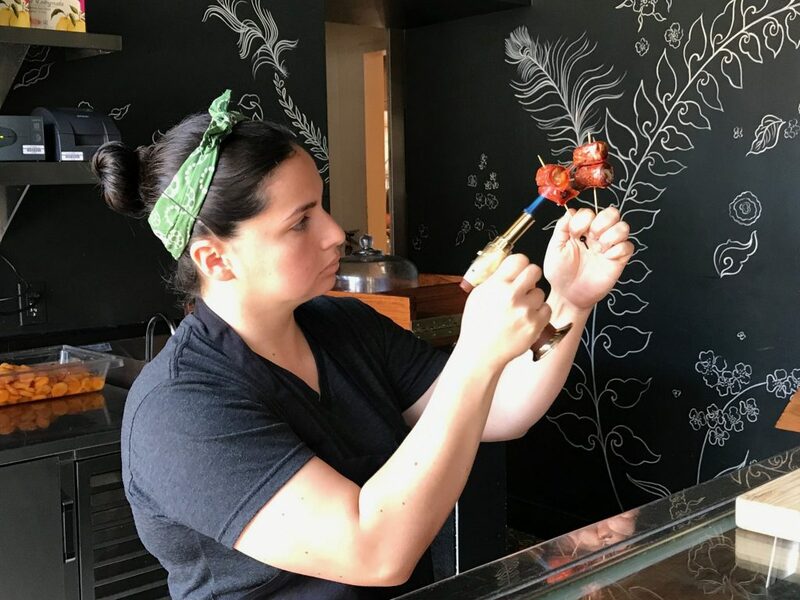 A hole in the wall serving up delicious pinxtos and high-end vermouth tastings, Poquita is cute and sweet and small. Just enough tables and bar stools to maybe fit 20 people. 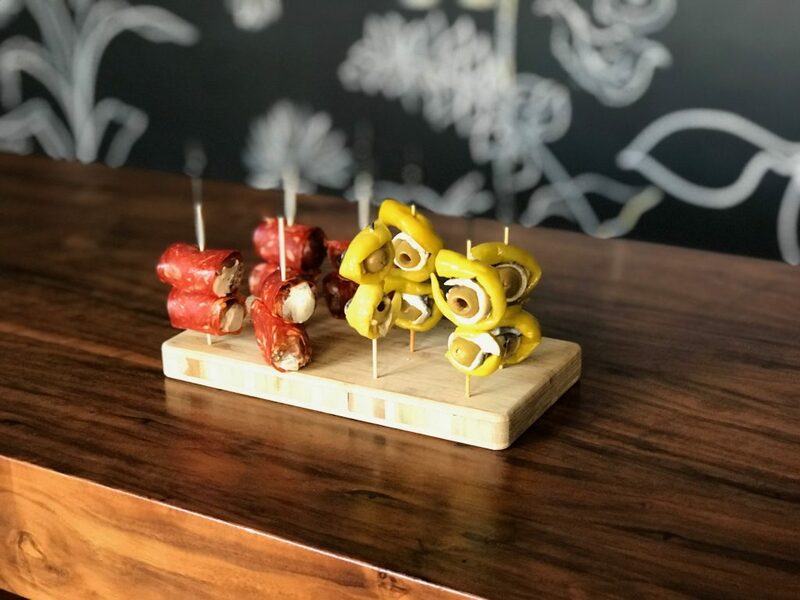 Behind the bar, staff fires up a delicious sampling of pinxtos – the form of tapas most popular from the Basque Region of Spain. Photography Tip: When shooting food, use the portrait setting on your iPhone and place the dish in front of a long, deep space. The photos come out crystal clear on the food, with an out-of-focus background that gives more attention to the main subject – the plate of food. Pinxtos with spicy serrano ham stuffed with dates and sharp bleu cheese, along with skewers of olives, sardines and peppers. 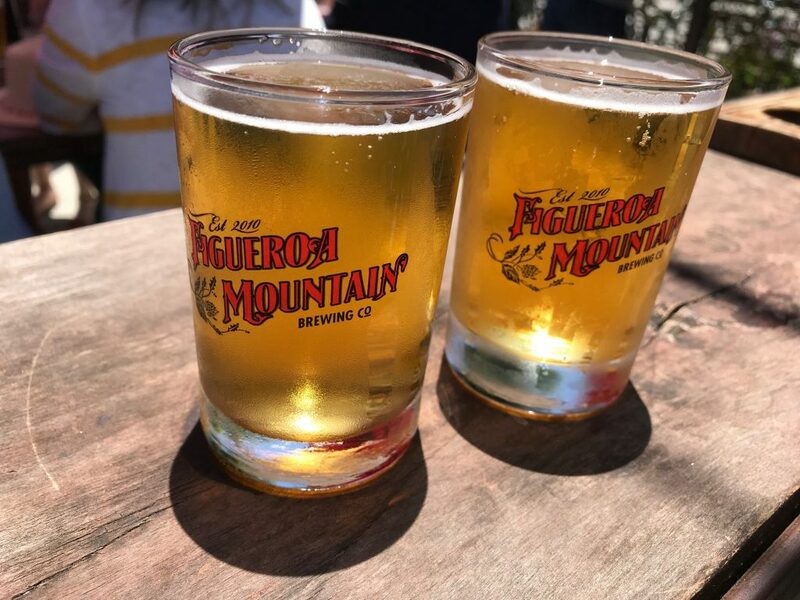 Stop #3 – Figueroa Mountain Brewing Co.
Down the street and across, Figueroa Mountain Brewing Co. was HOPPING. We arrived at about 12:30 pm on a Sunday, and the place was packed with people enjoying microbrews and watching the game. Since the girls were with us, we made our way to the patio where kids could mingle with adults drinking beer. We tasted a flight of brews from Figueroa, all delicious. I could not tell you a single name of anything we drank, but I liked them all! The beer flight at Figueroa Brewing Company was delicious. Photography Tip: When shooting drinks or liquids, try to position the glass with light coming through from the back or side. This way the beer (in this case) lights up, frost on the glass sparkles and you end up with a tantalizing photo. A couple of blocks down, we sat down under canvas shades at the comfortable picnic tables of Shalhoob’s Funk Zone Patio. Shalhoob Meat Company has been a staple in Santa Barbara’s Funk Zone for over 40 years. Serving guests and local restaurants their premium quality meats, they decided to open their own little restaurant spot. If you go, you MUST order the Tri Tip Sandwich – it is heaven. 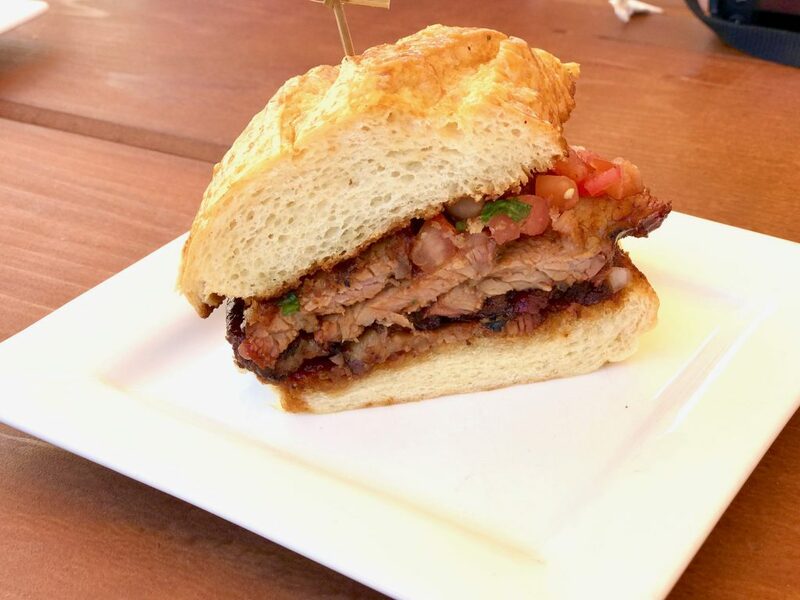 Delicious smoked meat is perfectly spiced and grilled, sliced thin and served with pico de gallo and a horseradish sauce I could drink straight up. 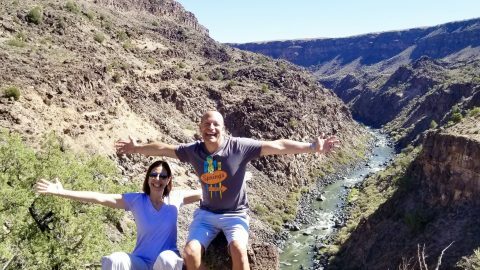 I wanted more but we had to go to our next stop! The tri tip sandwich at Shalhoob’s Funk Zone Patio was out of this world. Sister restaurants owned by Funk Zone leader and entrepreneur Sherry Villanueva, The Lucky Penny and The Lark sit next to each other. The Lucky Penny serves woodfired pizzas with interesting ingredients, and we sampled the machaca and egg burrito pizza. On another visit we had dinner at The Lark, and it was one of the best meals we’ve had in Santa Barbara. I guess others agree, because now it is nearly impossible to get a table. Photography Tip: Pizza is really hard to photograph, as evidenced by my shot below. I got nothing for you here. Down a sweet little alley from The Lark, we popped back out in a courtyard directly between Figueroa Brewing and a fun wine tasting bar called Santa Barbara Wine Collective. There are now many, many tasting rooms in Santa Barbara – so many they have dubbed it the Urban Wine Trail. With tons of award-winning wineries just up the mountain pass in Santa Ynez Valley, people still don’t want to drive that far. So the wineries came down here and set up shops. At the Santa Barbara Wine Collective, several wineries have gotten together to share a space. We tried the Chenin Blanc from Notary Public Wines, along with their Cabernet Sauvignon as well. Unbeknownst to the staff there, our girls are not 21 yet they poured glasses for them anyway. Oh well, more for us! We slurped their servings down too. So delicious. The wine and cheese tasting at Santa Barbara Wine Collective was fun and funky. 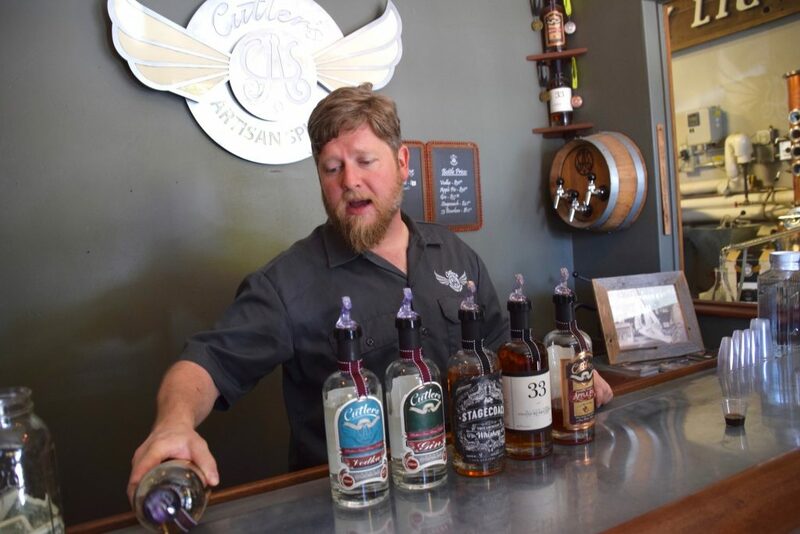 Our last stop turned out to be great fun – a boozy interlude at Cutler’s Artisan Spirits. With the master distiller himself doing the pouring, we tasted healthy shots of six (SIX!) different spirits. We started with their vodka, and then moved on to gin. Any of my friends out there may know that I cannot stomach gin (product of an unfortunate episode at a tender age – say no more) and so I skipped that round. From there, we sampled the most delicious whiskey and bourbon ever. The 33 Straight Bourbon Whiskey was so good that we bought a bottle right then and there. The final two tastings were of apertif whiskeys, one called Apple Pie and the other I’m a little fuzzy about. Both were surprisingly good – sweet, nutty and robust. Photography Tip: Never try to take a good photo after six shots of premier hooch. That is all. The man himself, Ian Cutler, pours our group tastes from six of his finest spirits. We came home with a delicious bottle of bourbon.